When I first unboxed my Cell Fusion Special Edition Golf Shoes my mind raced back to the 80's a time when I actually had hair (a mullet no less) and when Miami Vice and the pastel craze were king. Puma's Special Edition Cell Fusion golf shoes would fit in nicely back then. I definitely could see Sonny Crockett wearing a pair of these with his trademark white linen pants. These golf shoes are clearly geared towards the younger crowd and why not with a young upstart golfer in Rickie Fowler as their spokesman, Puma clearly knows the direction they're going in. So would I, a 42 year old hacker, father of 3 be able to rock these pastel head turners. Read on! 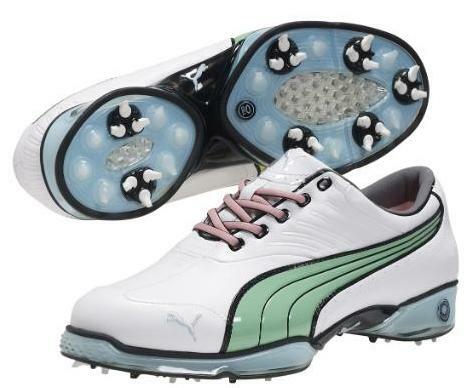 Last year I had the opportunity to review some Puma Tipper Golf Shoes and was thoroughly impressed with the technology used in the shoes to make them so lightweight yet so sturdy for all kinds of golfing conditions. This Special Edition Cell Fusion model doesn't disappoint. You notice right away from holding the SE model the Smart Quill technology. This year Puma takes it to another level with replaceable SmartQuill spikes with Fast Twist 2 directional locking technology for more grip. The Smart Quills combined with the iCell technology in the forefoot and heel of the shoe makes this not only more comfortable than the Tippers I reviewed but also give you better traction to the ground during your swing. Puma doesn't pull any punches with its SE Cell Fusion model. The retro two-tone Puma stripe in yellow and green is eye catching to say the least. When I first wore them you should of heard the comments from my fashion conscience daughters as well from some of my playing partners. With the crystal blue base these are the slickest golf shoes Puma has released. It took some getting use to, the color combination but after awhile wearing with them with a Puma shirt and pants with similar color palettes I quickly got over it. From the pictures you'll also note the contrasting piping shoelaces. Puma gives you three extra sets of shoe laces to change it up whenever you like, a nice touch. After a few rounds, the SE Puma Cell Fusions proved to be a great lightweight, sturdy and comfortable golf shoe. I wore them straight out of the box no break in period here. My feet never seem to get tired or fatigued even in the heat we've been getting recently in the Ottawa area. The Smart Quill spikes provided great traction for all types of golf shots whether it was on the fairway, the bunker or the rough. The Cell Fusion's waterproof full-grain leather upper managed to keep me dry in some torrential rains recently and that can't be said for all golf shoes. If you want a retro stylish looking golf shoe that Rickie Fowler wears, the SE Cell Fusion fits the bill. If you're a little more conservation the Cell Fusion's also comes in Black/White/Red and White/Snorkel Blue. Don't worry if you have a hard time matching them with rest of your golf wardrobe because Puma has some great SE apparel to go along with these shoes. Stay tuned for more reviews! After a bit of getting use to I even managed to pull off wearing these golf shoes. How can you not like golf shoes that are so lightweight and comfortable and actually help your golf game. Better traction and stability awaits you with the Cell Fusion Special Edition Golf Shoes . SE Cell Fusion shoes can be bought online at the Puma Store. Retail value $180.00 USD. Trendy Golf also sells them as well as Fairway Styles. Be sure to follow Puma Golf on Twitter @PUMAGolf and Facebook at Puma Golf. Wow. That color combination is scary. Yeah this colour combination is still very scary. This Design is really impressive, lol. These one in black/blue would be very nice. Great shoes, look very good. Link doesn't work. It seems these shoes are sold out! These shoes are sold out! You can't buy them anywhere as new. The simple language and concise page style really attract me. And your articles give out the pure soul of yours. Were they designed by that guy that hosts ‘Queer Eye for the Straight Guy’? Golf shoes have always looked effeminate buy these are gayer than most. I like this style, just change the color of the laces thats all. Cool shoes, I like them very much.